Have you ever considered a river cruise before? Travel agents are finding that more millennials and younger generations are seeking to explore Europe by way of river cruise. And why shouldn’t they? After knowing what is included in a European river cruise, you may just be looking to go on one yourself! From the rooms to the shore excursions, the all-around experience far surpasses what you have only dreamed about. 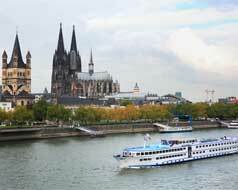 In the Europe river cruising industry, there has never been a better time to go…or more fun! If you have ever been on an ocean cruise line, you know that your room is generally going to be cramped unless you purchase a suite cabin or something equivalent. Rooms on a river cruise line noticeably give you more space and close up views of the magnificent cities and charming little towns you pass by EVERY DAY! Now think all-inclusive where everything is included and voilà! You have a river cruise! Your meals, drinks, cabin room and shore excursions are all included in your cruise cost! Plus, you are being transported to NEW cities every day! Places where an ocean cruise cannot even touch. One of the best parts of river cruising is the fact that you can choose your own pace. A rigid port experience will not even be in your vocabulary because fun is the new reality! You will have opportunities to pack your vacation with excursion after excursion. Or you can explore the ports in leisurely strides. Your time in port can be spent doing what you want. It is truly the perfect time to see Europe via a river cruise. It is simply convenient, highly satisfying, and completely worth it.